David Backes silences all critics. You can knock one thing off of John Davidson and Doug Armstrong’s to-do list for the year. After weeks of telling the media they were close to signing an extension to Blues forward David Backes’ contract, they have finally inked the deal. Backes’ contract is a five year deal that amounts to $22.5 million, a deal that averages out to a $4.5 million dollar cap hit to the Blues. The deal also includes a no trade clause, which ensure that Backes will be wearing the Note until at least the end of the 2015-16 season. The upcoming unrestricted free agent contract has been the subject of much speculation around the league, especially after the Vancouver Canucks gave the power forward an offer sheet during his restricted free agent contract three years ago. Many people assumed a leader like Backes would command a high salary on the open market. The theorized asking price for Backes unique services was around the $5 million range. By locking Backes into a deal the Blues kept a fan favorite, and possibly saved themselves a little money in the long run. 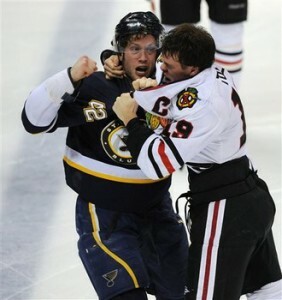 Many fans will be glad to keep Backes in St. Louis for the next 5 years. However, some might be wondering if we have overpaid for a forward who until last night had only scored one goal on the season? Here is the reality to David Backes. He is a player notorious for slow starts, but even in his slow starts he constantly maintains hard work on and off the ice, and that is a valuable chip to any organization. He is just the type of player you want when you are trying to make your run into the playoffs.